Today I needed cake. We didn’t have any, so there was only one thing for it, to make some. 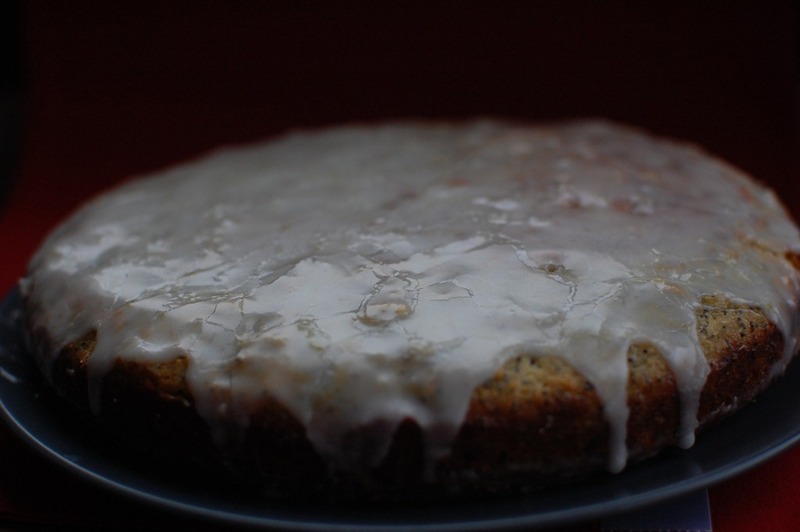 I fancied something zesty and fresh, and this Lemon and Poppy Seed Cake sprung to mind. I used to make a lot a few years back, but kind of got out of the way of it. So now was the time to re-introduce it! I haven’t iced this in the past, but today I decided to go the whole hog – why not it’s horrible weather outside. Use an electric whisk to beat the caster sugar and butter until light and creamy. Add in the eggs one by one, beating each in well. Then fold in your ground almonds and poppy seeds, the lemon zest and juice and the sifted flour. Spoon the mix evenly into the prepared cake tin and bake in the preheated oven for 40 minutes, or until lightly golden. Make your lemon syrup by heating the sugar and lemon juice in a pan until the sugar has dissolved completely. Whilst your cake is still warm poke holes across the top with a cocktail stick and pour your syrup over. To make the icing,sift the icing sugar into a bowl and add the lemon zest and juice, stirring until nice and smooth. When your cake is almost cool, place it on your serving plate and pour the icing carefully over the top. If your icing is thick the you should be able to smother it on with a knife.